(Community Matters) Culture is how you manage a company of over 500 or 1,000 employees. Mission is the north star. 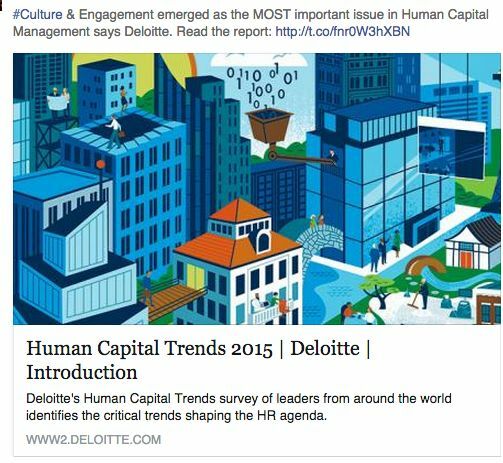 Deloitte’s 2015 Global Human Capital Trends: Culture & Employee Engagement Issues No. 1 Company Challenge. Culture and engagement is the most important issue companies face around the world. 87 percent of organizations cite culture and engagement as one of their top challenges, and 50 percent call the problem “very important. Given the harsh spotlight of this new transparency, an organization’s culture can become a key competitive advantage—or its Achilles’ heel. Culture and engagement are now business issues, not just topics for HR to debate. Research shows that a variety of complex factors contribute to strong employee engagement, including job design, management, work environment, development, and leadership. Today, more than twice as many employees are motivated by work passion than career ambition (12 percent vs. 5 percent), indicating a need for leadership to focus on making the work environment compelling and enjoyable for everyone. While most leaders are measured on the basis of business results, organizations must begin holding leaders accountable for building a strong and enduring culture, listening to feedback, and engaging and retaining their teams.